1. Activa LPG water heater comes with fully auto matic japnese technolodgy. 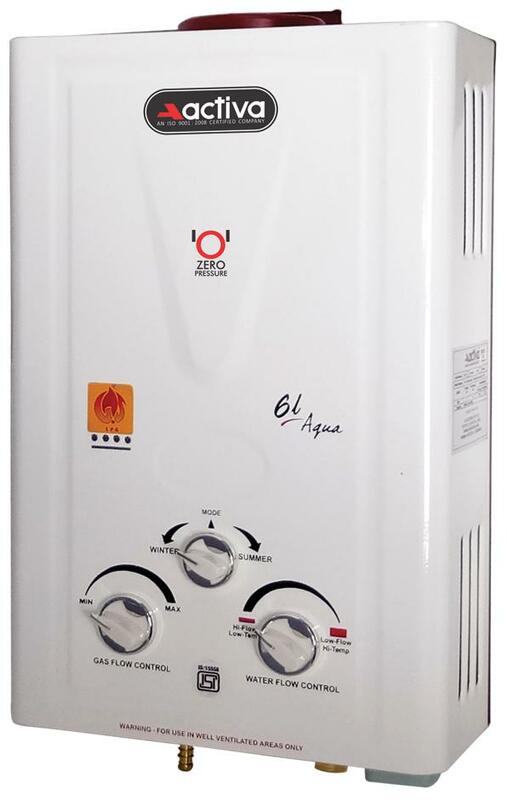 # 2. the activa gas water heater works instantly with flame failure protection. # 3. over heating safety system to ensure your safety. # 4. 75% cheaper than elecric gysers and 30% more gas saving by using the best(extra heavy) heat exhanger. # 5. battery operated automatic ignition. # 6. very elegant,attractive and different body design with topclass quality and features. # 7. extra large burner with summer winter options for quick water heating. # 8.gas and water flow adjustment. # 9.flame failure safety device. # 10.pure copper container for more durability and efficiency. # 11.suitable for both low and high pressure installations # 12.self installation. # The images represent actual product though color of the image and product may slightly differ.